Discovering Cork is proud to announce our 2015 summer scheduled Cork day tours! Our exciting range of coach tours around Cork and beyond offer great value options to anyone looking to see the very best parts of Ireland. Whether you only have a day to take in some unmissable sights, or simply want to finally see parts of the country you have never gotten around to visiting, Cork Day Tours can provide you with your ideal day out in Ireland. Our schedule of tours feature a healthy blend of local Cork City and County tours, as well as trips to some of the biggest attractions across the rest of the country. With such a diverse range of coach tours available, all of which include an engaging and knowledgeable local guide, you can be sure that Cork Day Tours will make your day of exploration a truly special and enjoyable experience. A classic Cork experience comes on the Blarney Castle and Kinsale day tour, which brings you through so much of Cork’s most iconic scenery and attractions. With stops at Blarney Woollen Mills, Charles Fort, Desmond Castle and the beautiful seaside town of Kinsale, you will get a first-hand introduction to Cork’s fascinating history while also enjoying the finest parts of the Cork countryside. This tour also includes a visit to Blarney Castle, where you can kiss the legendary Blarney Stone and inherit the gift of eternal eloquence. For a more metropolitan day out, look no further than the Cork City and Whiskey Distillery tour. Visit all the most recognisable and popular sights from Cork’s city centre, with your expert guide able to enlighten you about the interesting histories of such places as The English Market, the historic Cork City Gaol, Blackrock Castle Observatory and the award-winning Glucksman Art Gallery on the grounds of University College Cork, as well as so much more. Cap the day off with a tour of the world famous Jameson distillery in Midleton, just a short distance from Cork City. One of the most popular attractions in the South of Ireland, The Jameson Experience treats guests to many fascinating insights into how this famous Irish whiskey has been produced down through the centuries. Our Havens, Harbours and Hidden Gems tour is a spectacular trip through the coastal beauty of County Cork. With a fantastic stretch of scenic wonder down along the Cork coastline, this exploratory day tour will show you the best bits of County Cork that only the locals know about. With stops at The Franciscan Abbey in Timoleague, Ballydehob multi-arched bridge, Schull Village, Crookhaven as well as the Mizen Head Visitor Experience and the unparalleled natural setting of Gougane Barra, the Havens, Harbours and Hidden Gems tour is the only way to uncover the real wonder of County Cork. Our tours outside of Cork are even more impressive. The Cliffs of Moher day tour takes in a number of Ireland’s most popular tourist destinations all in one outing. 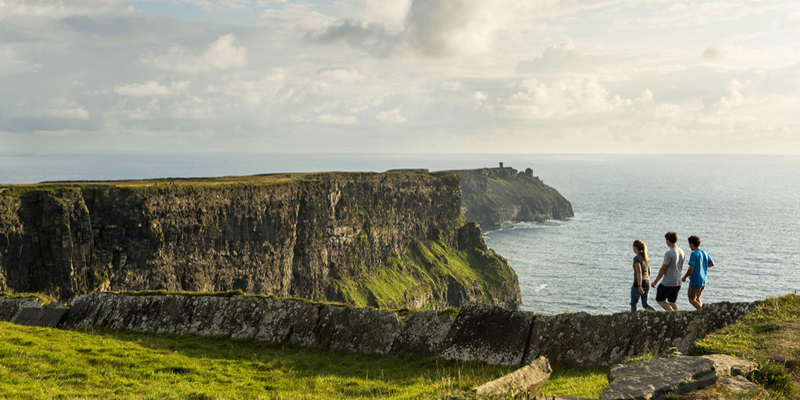 Naturally, a trip to The Cliffs of Moher is the highlight, where you can take in the magnificent panoramic views out across the Wild Atlantic Way from the cliff tops. But before that, you will also be treated to a tour of Bunratty Castle and folk park, with the famous Irish castle that boasts such a sumptuous garden on its grounds. With a trip to the Foynes Flying Boat and maritime museum, a particularly interesting and unique museum dedicated to the early days of aviation, featuring a full replica of The Boeing 314, one of the most successful passenger-carriers from the 1930’s and 40’s. Our Ring of Kerry Highlights tour manages to capture so much of the magic of the Ring of Kerry, with all of the most outstanding parts of this stunning landscape included on the route. Feast your eyes on the likes of Moll’s Gap and Ladies View, as well as Torc Waterfall, The Lakes of Killarney, Killarney National Park, Gap of Dunloe and Ross Castle. With time to explore the vibrant local towns of Killarney and Kenmare along the way, you can get the real Kerry experience on this day trip. Our last coach tour takes us to the Sunny South East for the Waterford Crystal day tour. With a stop along the way at the charming seaside town of Youghal, on the border between Counties Cork and Waterford, where you can survey the ancient medieval ruins that still remain there. Upon arriving in Waterford, you can explore the Viking Triangle, the historic group of buildings that formed the Viking stronghold when the city was first established. With all this taking place before you enter the Waterford Crystal visitor centre and delving into the process required to make these world class pieces, the Waterford Crystal day tour is a dream day out for anyone interested in the history of Ireland. The unbeatable Cork Day Tours schedule will begin running in May. With tours running from just €39 per person, the toughest decision you will face is whether you prefer to explore the majesty of the Ring of Kerry, the serenity of The Cliffs of Moher or to get in where the action is in Cork City.